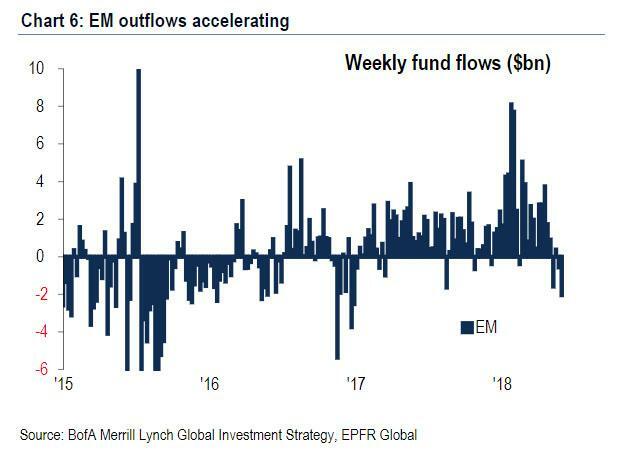 EM outflows accelerate: largest weekly EM equity outflow since Dec'16 (Chart 6); EM debt & equity redemptions >$8bn the past 5 weeks; but remember this pales in comparison to $235bn EM inflows since Feb'16. 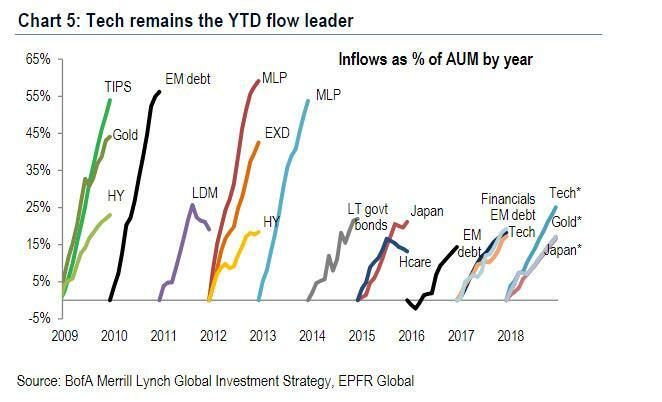 Meanwhile, as investors put money into US stocks, they liquidated US debt holdings resulting in another week of substantial credit outflows, to the tune of $1.2 billion from IG and $1.4 billion from HY, although as Hartnett notes, "this pales in comparison to $360bn inflows to IG+HY Feb'16 to Feb'18." A defensive posture was also observed when looking at sector rotations, where inflows went to defensive sectors (Health, Consumer), REITs, Tech (which remains 2018 flow leader YTD - Chart 5), offset by redemptions from Fins & Energy. Similar retrenchment was also observed among BofA private (aka high net worth retail) clients, as a result of the first week of equity ETF redemptions since Dec'17, driven entirely by selling of EM equity ETFs. 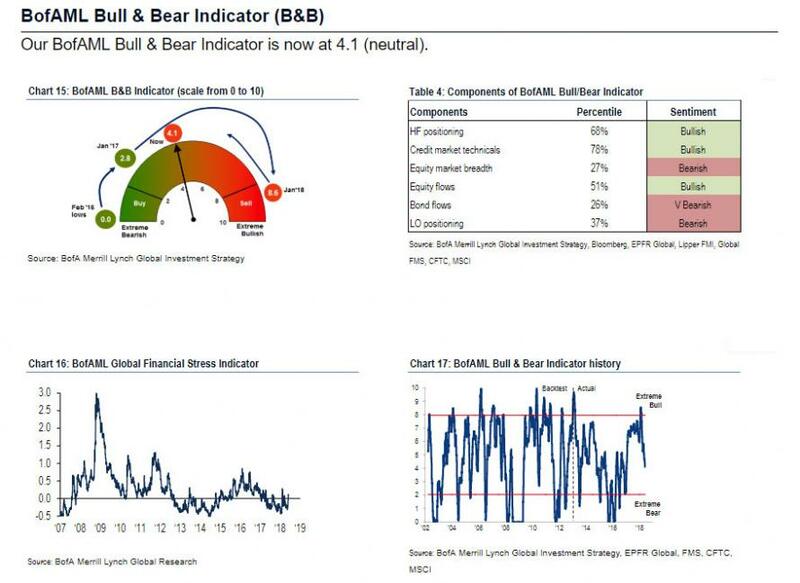 This bearish sentiment impacted BofA's proprietary Bull & Bear Indicator, which this week fell to only 4.1, the lowest reading since Jan'17, on HY & EM outflows, more HF positioning, and weaker technicals. And yet despite the tepid bearish sentiment, there has been no bull capitulation yet. 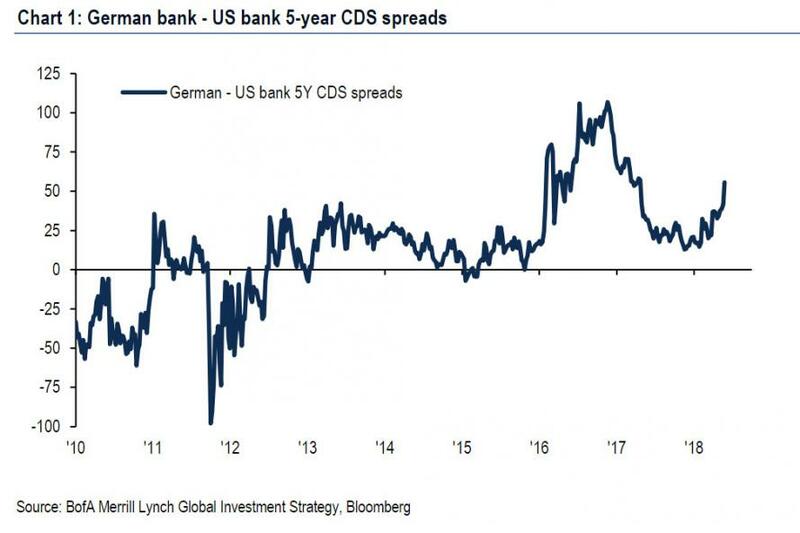 Credit: if lower Treasury yields fail to incite a bid to EM, EU, HY, IG credit, that - to Hartnett - means excess debt, all $320 trillion of it + lame bank lending + weak global growth = deleveraging cycle begins (something one can already see in a handful of German banks, whose CDS is rapidly widening vs US). China: watch export growth next week as well as the ongoing Korea & Japan weakening: Hartnett predicts that should China export growth fall, investors will anticipate CNY devaluation and EM contagion, something which the Securities Daily already hinted at last night when it reported that China may further cut the RRR by 0.5-1.5% by year end. 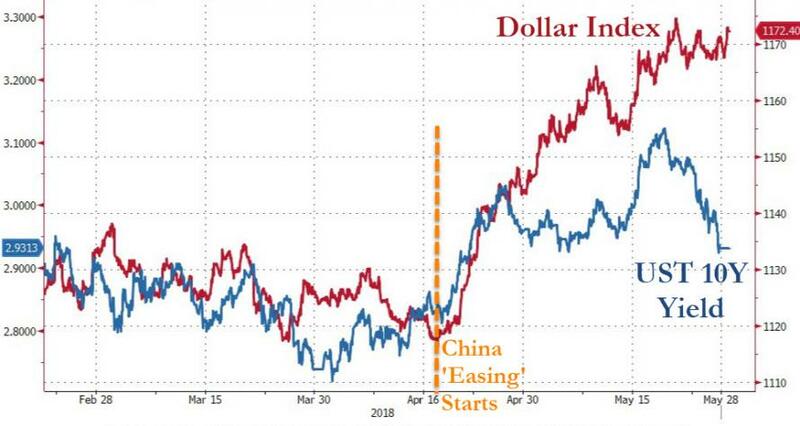 As a reminder, it was the April 17 RRR cut that launched the surge in the USD/10Y Yield, so another cut will send the dollar surging even more, with very adverse consequences for US corporations and emerging markets. US: Here keep a close eye on the record delta between US and EU equities which are at record high; Meanwhile the one catalyst that can spoil the US equity party is the return of stagflationary data to the US, such as a surge in US wage growth (AHE >0.4% which "traps" the Fed) & weak payrolls (<150k), both of which are negative US equities although neither of which will take place today, however, after May's "spectacular" jobs report. Meanwhile, the biggest threat to the "last bull market" remains forced selling of US equities, specifically tech stocks. That covers the big June risks. What about the bigger picture? 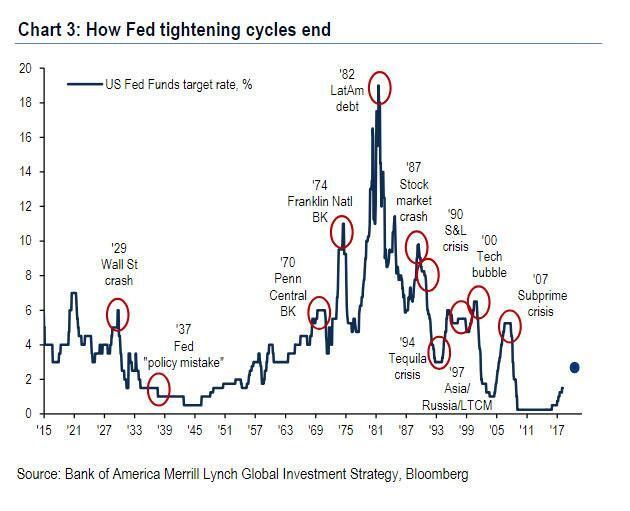 Here Hartnett says that he remains "tactically defensive" until asset prices force the Fed to "pause" tightening in Sep-Dec'18, i.e. stocks fall enough for Powell to end up on the rate hike cycle in roughly 2-3 more rate hikes.